Just sometime before, Google was forced to pull off 21 free apps from Android Market, in fear of the apps being malware. 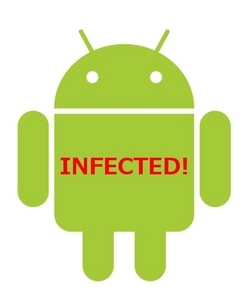 As being reported by the Google, the apps are malware and being aimed at getting root access to the user’s device, gathering wide range of data and then downloading some code on the device without user’s knowledge. Android Police was the first one to bring Google’s notice to these apps, and the company has acted swiftly to pull them off. But still the damage is not fully thwarted as these apps have already been download by approx. 50,000 Android users. The apps in question are pretty much hideous and questionable in the way they are present in the Android Market themselves. These apps are particularly rip-offs from the already popular apps and bear the same name as Mashable reports. These malicious apps work like this: After downloading the app, the app roots the Android device using a method like rageagainstthecage. After that the app uses an Android APK to collect the data from user and device such as your mobile provider and user ID. And finally, the app opens a backdoor for your device and downloads and executes more malicious code. Previous Entry: Steve Jobs to Appear at iPad 2 Event?